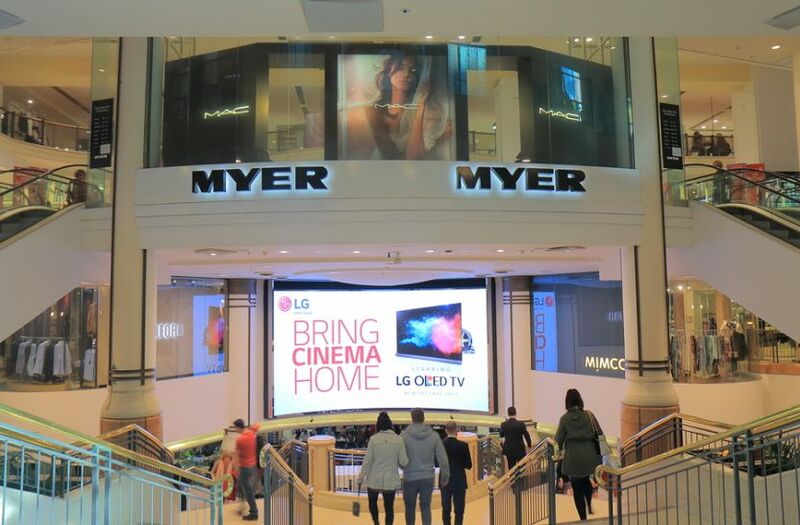 Myer has renewed its focus on a smaller store footprint, online growth and exclusive brands, yet brokers are sceptical the business can make inroads against intense competition. Some improvement for challenged retailer Myer ((MYR)) was evident in the FY18 results and the new CEO, John King, has announced a reinvigorated strategy to focus on online growth, a smaller footprint and an improved organisational structure. Gross margins surprised brokers to the upside, increasing 105 basis points in the second half. Sourcing benefits for Myer exclusive brands were cited, as well as reduced markdowns. The improvement in gross margins was primarily from favourable weather, that resulted in less discounting, so Citi does not expect the same factors to be repeated in FY19. Fourth quarter sales were better, as the decline over the second half of -2.4% was less than the third quarter's decline of -3.1%, and the first half decline of -3.0%. Management suggests fourth quarter momentum is continuing into early FY19. Ord Minnett is confident the new strategy will provide profit growth, despite near-term weakness in sales. Sales are to shift to Myer exclusive brands from concessions, supporting gross margins. Yet the broker also suggests the company appears more willing to engage with the "discount value" customer and less with the "aspirational" customer. Ord Minnett upgrades to Hold from Lighten, believing the risk/reward ratio no longer justifies the prior rating. UBS takes heart in several positives in the result, including improving like-for-like sales, relaxed debt covenants and better gross margins, although remains sceptical about the ability to reinvigorate the top line. As balance sheet pressure has been alleviated for now, UBS upgrades to Neutral from Sell. Myer will struggle to grow earnings, the broker asserts, because of competition, while cost reductions will come to an end. The business has too much space in a structurally challenged industry and is also constrained in its ability to rationalise this space, given the $2.5m 13-year lease tail. Nevertheless the stock reflects the risks, UBS believes. Myer has pulled back on discounting but Citi suggests caution should prevail regarding any retailer trying to unwind promotional activity, given customers are accustomed to buying on promotion. Management has stressed the importance of profitable sales, which Macquarie agrees is a sensible sounding strategy, yet with reduced markdowns and new focus on exclusive brands the risks to the top line are now higher. A focus on Myer exclusive brands has been a feature of previous strategies and may be insufficient to drive foot traffic, in the broker's view. The category is already highly competitive and challenging and Macquarie envisages risks skewed to the downside, with cost savings likely to become harder to achieve. Still, there is some, albeit modest, potential for corporate activity. Credit Suisse agrees that the strategy to use the Myer exclusive brands has been tried before and the product did not resonate sufficiently with customers. Longer term, the plan appears to be a continuation of reducing trading space and growing the online business. In the case of the latter, Credit Suisse observes Myer has little competitive advantage. Online sales, ex in-store iPads, grew 34% to $192m and signal a deceleration in the fourth quarter from growth of 49% in the third quarter, as the company focused on more profitable sales. Online now absorbs 7.7% of total sales. A new website will be launched progressively from this month. The company has secured a new debt facility, although confidence will remain a constraint. Macquarie currently forecasts earnings for FY19/20 that are within covenants but a -20% reduction to current estimates for operating earnings (EBITDA) would approach the threshold, possible in downside scenario. Additionally, the remaining intangibles on the balance sheet are at risk of write-downs. Under the new debt facility, dividends are only permitted when the company covers its fixed charge obligations by 1.65x. The refinancing package provides a stable funding platform, Credit Suisse agrees, and this reduces the risk for the medium-term. The broker maintains forecasts, which suggest the business will hold its profit levels over the next several years. Sales revenue is likely to decline in FY19, nonetheless, as unprofitable sales are removed. Removing unprofitable sales is easier said than done, the broker points out, as it requires a high level of capability in the supply chain. FNArena's database shows three Hold ratings and three Sell. The consensus target is $0.39, suggesting -11.4% downside to the last share price. Targets range from $0.31 (Credit Suisse) to $0.45 (Macquarie).